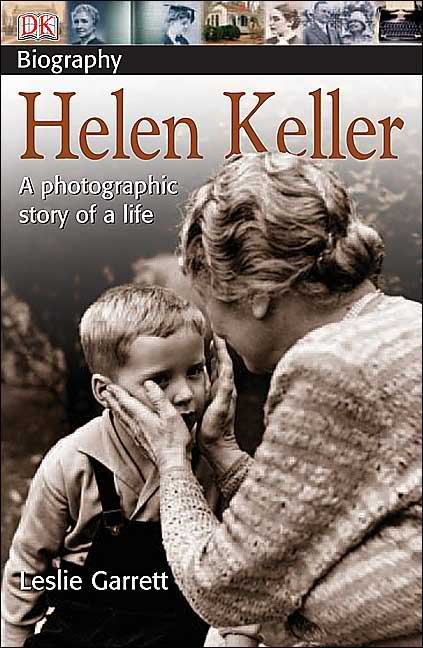 Helen Keller "Self-pity is our worst enemy ..."
At the age of two she suffered an illness that left her blind and deaf. 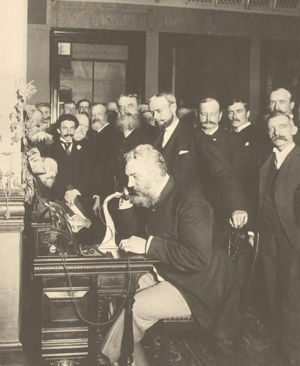 Her parents took her to Dr. Alexander Graham Bell who recommended the Perkins Institute for the Blind in Boston. 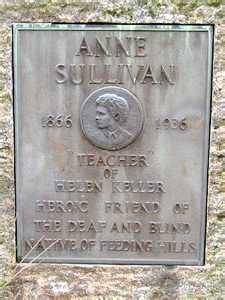 It was there, at age of 7, that Helen Keller was taught by Anne Sullivan through the sense of touch. 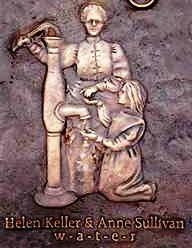 Anne eventually taught Helen to read Braille. 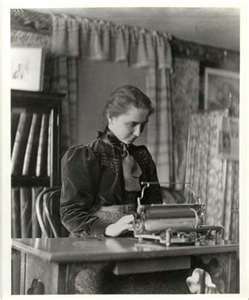 Helen Keller began attending Radcliffe College, where Anne Sullivan interpreted the lectures. 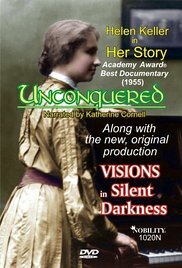 Helen became concerned about all the blind, especially those blinded in World War I or by poor working conditions. 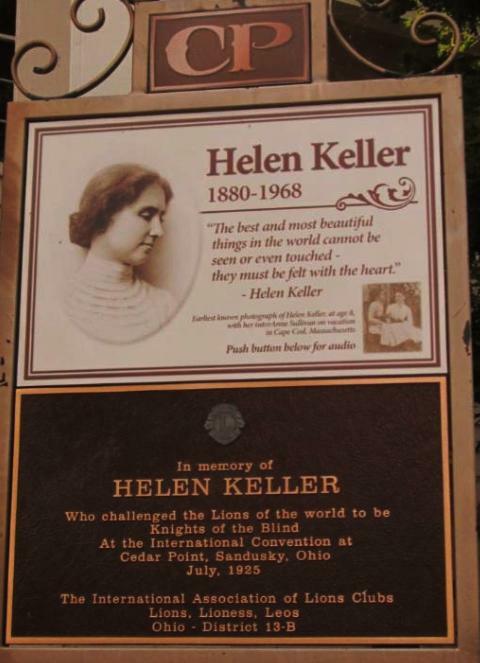 Though naive in her political views, she received numerous international honors for her efforts to help the blind. 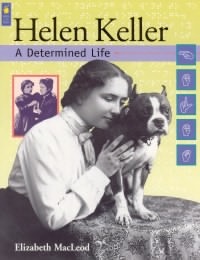 "I thank God for my handicaps, for, through them, I have found myself, my work, and my God." "I can see, and that is why I can be so happy, in what you call the dark, but which to me is golden. I can see a God-made world, not a man-made world." "It gives me a deep comforting sense that 'things seen are temporal and things unseen are eternal.'" 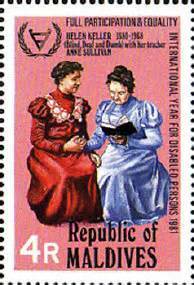 The Jewish & Christian Bible view of handicapped persons is strikingly different from other belief systems. Hindu and Buddhist attitudes is that a handicapped person is being punished for sins of a supposed past life by an impersonal "bad" karma. The Socialist attitude is that a handicapped person is a burden on the State, being worth less because of their limited capacity to contribute to society. "Thou shalt not curse the deaf, nor put a stumblingblock before the blind, but shalt fear thy God: I am the LORD,"
Deuteronomy 27:18 "Cursed be he that maketh the blind to wander out of the way. And all the people shall say, Amen." ﻿"Whatever you have done unto the least of these my brethren you have done unto me." I suppose you have heard the legend that represents opportunity as a capricious lady, who knocks at every door but once, and if the door isn't opened quickly, she passes on, never to return. And that is as it should be. Lovely, desirable ladies won't wait. You have to go out and grab 'em. 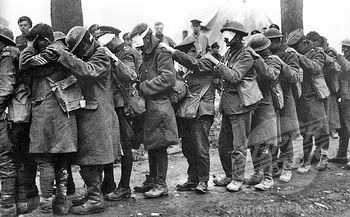 Its object is to make the lives of the blind more worthwhile everywhere by increasing their economic value and giving them the joy of normal activity ..."
"Try to imagine how you would feel if you were suddenly stricken blind today. That is just the kind of friend the American Foundation is going to be to all the blind in this country if seeing people will give it the support it must have. You have heard how through a little word dropped from the fingers of another, a ray of light from another soul touched the darkness of my mind and I found myself, found the world, found God. 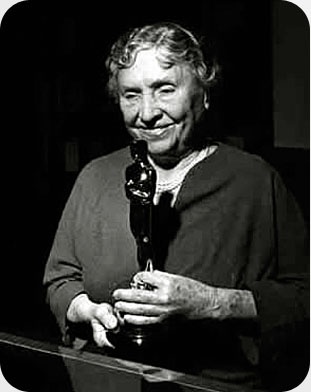 It is because my teacher learned about me and broke through the dark, silent imprisonment which held me that I am able to work for myself and for others ..."
"It is the caring we want more than money. The gift without the sympathy and interest of the giver is empty. 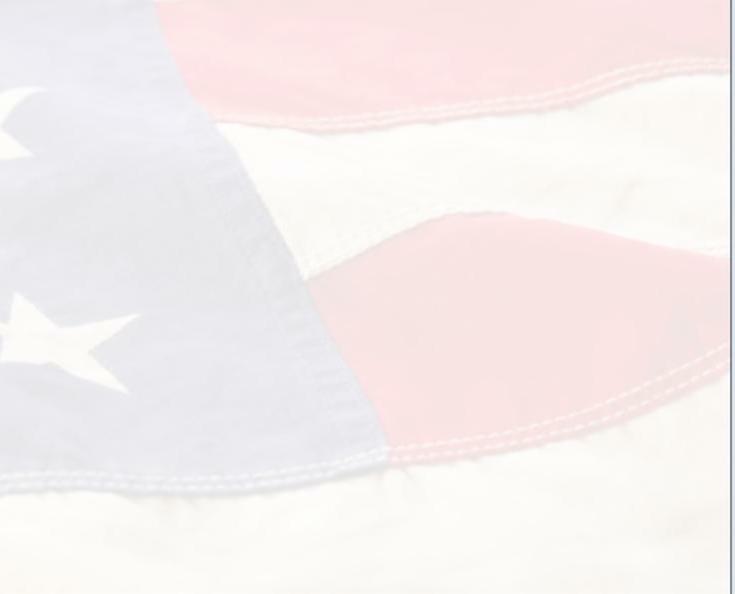 If you care, if we can make the people of this great country care, the blind will indeed triumph over blindness. 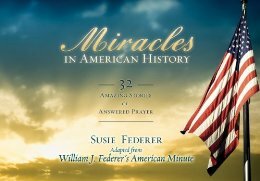 To foster and sponsor the work of the American Foundation for the Blind. I appeal to you Lions, you who have your sight, your hearing, you who are strong and brave and kind. Will you not constitute yourselves Knights of the Blind in this crusade against darkness? I thank you." 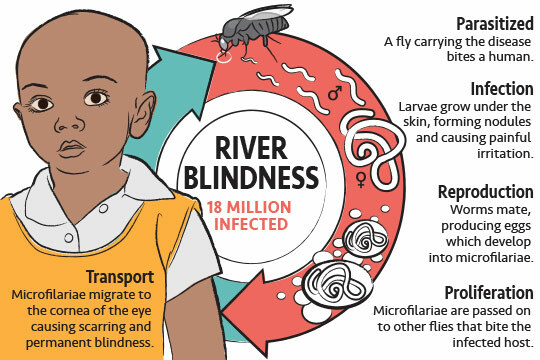 The LIONS adopted the mission for the detection of vision problems in children, provision of glasses for the needy, and many other such projects, such as an initiative to eliminate river blindness in Africa. 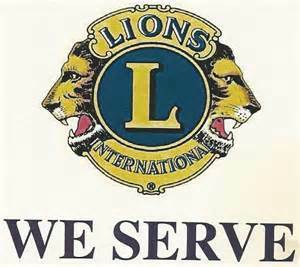 The LIONS Eye Institution for Transplant and Research is the leading institution for ocular science. 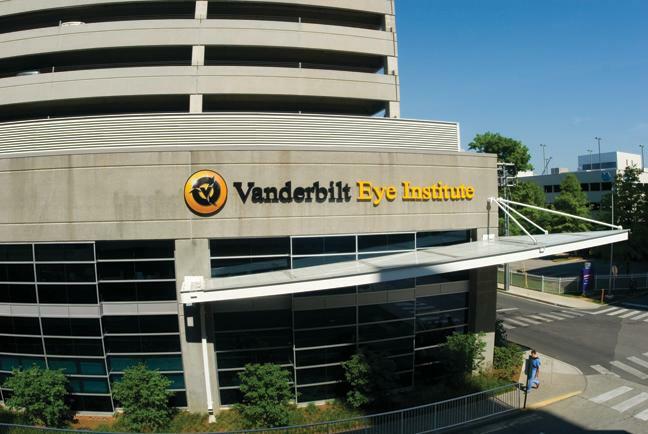 In Nashville Tennessee the Vanderbilt Eye Center has been funded by large donations from LIONS. 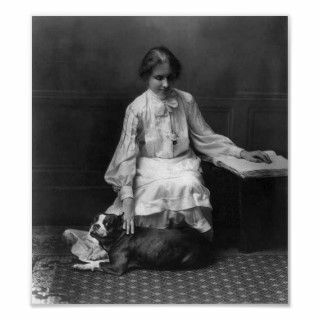 "Self-pity is our worst enemy and if we yield to it, we can never do anything wise in the world." 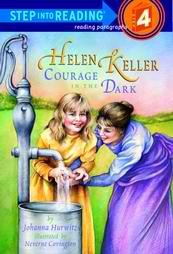 Helen Keller was introduced to President Grover Cleveland at age 7. 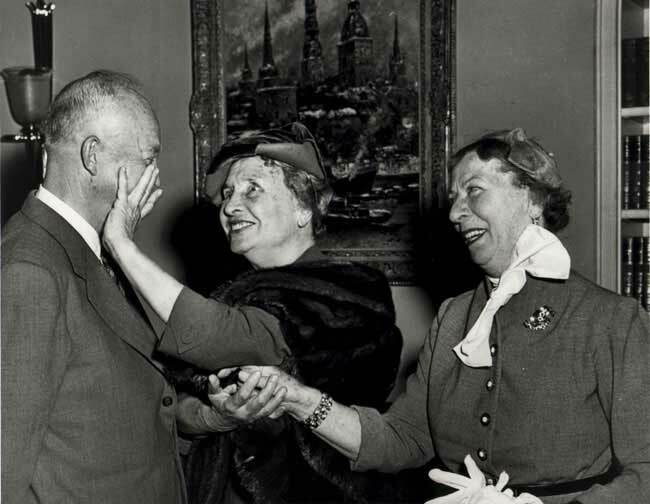 She met President Eisenhower in 1953. 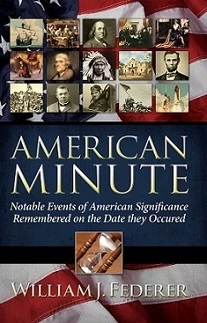 She received letters from eight U.S. Presidents -- from T heodore Roosevelt in 1903 to Lyndon B. Johnson in 1965. 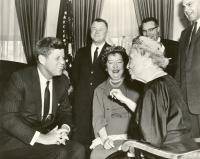 In 1961, Helen Keller met President John F. Kennedy. She received the French Legion of Honor and the U.S. Presidential Medal of Freedom. 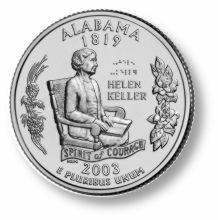 On March 17, 2003, the U.S. Mint i ssued a quarter coin representing the State of Alabama which honored Helen Keller. 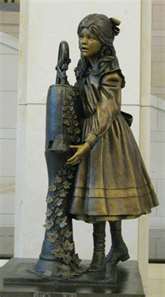 A statue of Helen Keller as a young girl, learning the sense of touch at a water pump is in the U.S. Capitol from the State of Alabama.